This case report from a field hospital in post-earthquake Haiti underscores the utility of portable ultrasound in austere environments. An 8-year-old boy was evaluated for several weeks of fevers and chills, general malaise, and increasing abdominal girth. He appeared ill with mild tachypnea, decreased breath sounds at bilateral lung bases, a distended abdomen with a palpable fluid wave, and bilateral pitting edema. This clinical picture was concerning for advanced schistosomiasis and ultrasound findings supported this presumptive diagnosis and helped direct treatment. 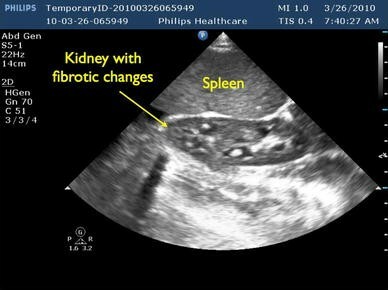 Images from this case demonstrated several classic ultrasound findings described by the WHO including hepatosplenomegaly and diffuse fibrotic changes in the hepatobiliary and urogenital tracts. 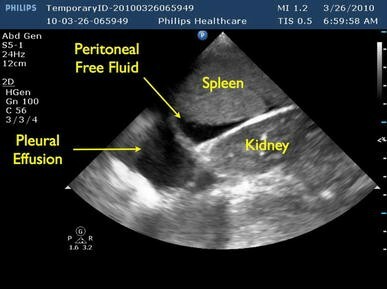 This case report demonstrates the effective use of portable ultrasound in making an accurate diagnosis and forming a definitive treatment plan for a patient in a resource-limited environment. Portable ultrasound is proving to be a valuable tool for the use in austere and post-disaster environments where resources for advanced imaging are limited [1, 2]. Field studies have demonstrated a variety of common clinical scenarios for which ultrasound reliably improves diagnostic accuracy and patient care . This report highlights the utility of ultrasound for a less common clinical entity seen in a field hospital in Haiti following the earthquake in January 2010. The following case was seen at the Disaster Recovery Center in Fond Parisien, Haiti in March 2010. While most earthquake victims were already in a stage of rehabilitation, the triage area of the hospital continued to receive a steady stream of new patients unable to find medical assistance since the disaster. The only imaging equipment available on-site was a Philips portable ultrasound with 12 MHz linear array and 5 MHz curvilinear probes. An 8-year-old boy arrived in triage with his mother who reported that for several weeks her son had frequent fevers and chills, general malaise and increasing abdominal girth. The child had no prior medical history and was in a good state of health before developing these symptoms. His vital signs were T 101, HR 135, BP 125/77, RR 30, Sat 99% RA. On exam he appeared ill with mild tachypnea, decreased breath sounds at bilateral lung bases, a distended abdomen with a palpable fluid wave, and bilateral pitting edema. Urine dipstick was positive for moderate blood and trace protein. 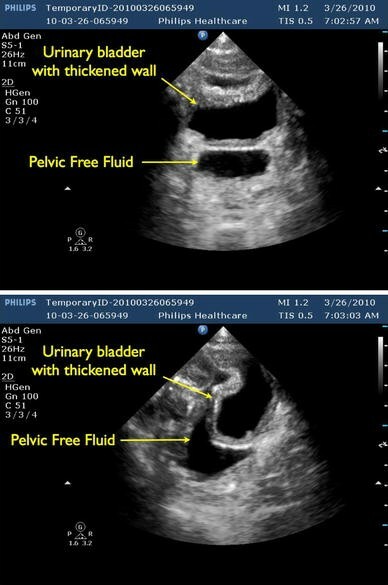 Bedside ultrasound was performed and yielded the following images (see Figs. 1, 2, 3, 4, 5, 6). This clinical picture was concerning for schistosomiasis and the ultrasound findings supported this presumptive diagnosis. Acute schistosomiasis is characterized by deposition of eggs in various tissues of the body, most commonly the hepatobiliary and urogenital tracts, with a resulting inflammatory reaction that leads to diffuse fibrosis and granuloma formation . 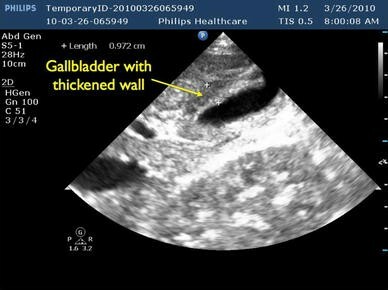 As the disease progresses, predictable pathological changes that can be detected with ultrasound occur including tissue fibrosis with thickening and the development of abdominal ascites and pleural effusions . The WHO released a standardized guide for the use of ultrasonography in schistosomiasis that has been validated in large-scale studies [6, 7]. Images from this case demonstrated several classic ultrasound findings described in the WHO guide including hepatomegaly (Fig. 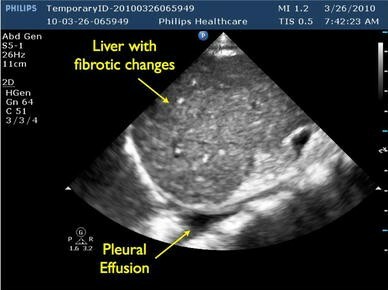 1) and diffuse fibrotic changes in the liver (Fig. 2), gallbladder (Fig. 3), kidney (Fig. 4) and urinary bladder (Figs. 5 and 6). Abdominal free fluid (Figs. 1, 5 and 6) and pleural effusions (Figs. 1 and 2) were also observed, suggesting an advanced disease state with compromise of the portal venous system. Given the severity of the illness, anthelmintics were started immediately and the decision was made to transfer the child to the University Hospital in Port-au-Prince for inpatient treatment and monitoring. Microscopic analysis of urine samples later confirmed the diagnosis of schistosomiasis. This case report further demonstrates the utility of portable ultrasound in making an accurate diagnosis and forming a definitive treatment plan for a patient in a resource-limited environment.